Gatwick Airport operates the world’s most efficient single runway and is the second largest airport in the UK, serving more than 46 million passengers in 2017. Gatwick flies to 228 destinations in 74 countries and operates 365 days a year. However, we know that an airport is so much more than just the passengers and aircraft that use them. Airports are eco systems formed of a variety of businesses catering for ever-increasing volumes of customers. Gatwick has over 250 organisations from multiple business sectors operating on its campus including airlines, ground handlers, hotels, security, retail, food and beverage and onward travel all of whom require IT services to function. We appreciate this category is for suppliers only, and for the sake of clarity, we believe that the IT Commercial Department at Gatwick Airport could be considered a non-aeronautical supplier of revenue-creating IT services at an airport for this award. With a wealth of experience and knowledge of the IT infrastructure at Gatwick, Gatwick IT Commercial Services are a provider who understand exactly what it takes to keep businesses running smoothly in a complex environment, and deliver the exceptionally high standards of service required for the daily operations of our customers. A good example of the success of this new model was when one of Gatwick’s largest airlines came on board in 2015. Originally the airline had multiple small pockets of their own infrastructure across the airport, each with their own mini network. Migrating onto Gatwick IT Commercial Services allowed them to have one large simplified and centralised network, break down silos and have the benefit of an onsite support team – which continues today. Abhi is passionate about reducing airport fragmentation and believes that by working together will create a more profitable environment for all. The third part of his new commercial strategy was to use innovation to improve internal efficiency and declutter processes while generating new revenue, but ultimately considering how we could make the passenger experience and customer operations better. It is these philosophies which prompted us to pursue a number of innovative solutions. Working closely with the IT Innovation team Gatwick IT Commercial Services were perfectly positioned to develop and supply next generation IT services. One example which led to new revenue for the airport, was producing our own internet bandwidth in 2014. Gatwick IT Commercial Services now provide a physical, stable and logical internet service to many customers which we provide on a per mb per month basis. By the end of March 2018 revenue for internet had increased 2.5 times from what it was in March 2015, and currently over 90 campus entities are taking internet services from us. In 2016 we implemented a resilient UHF Digital Radio Service which directly competes with other onsite radio suppliers. It improved the system reception and transmission performance, provided better support and improved system quality and Db Loss to our required operational standards. We also developed a VHF Ground to Air Radio service launched in 2017, which is a facility used by ground handlers and airlines for direct voice contact with aircraft whether on the ground or in-flight approximately half an hour out from the airfield. This is a key tool in delivering On Time Departure by conveying and confirming operational details between the Ops and Flight Deck such as passenger requirements, fuel or details of any technical issues. Consequently by the end of March 2018 the digital and Ground to Air radio services revenue was 14 times what it was in March 2016. Another example of IT Excellence is VisionAir, launched in 2017 which is the first cloud based Flight Information System (FIDS) to be rolled out at an airport. The new system provides services that are scalable, more flexible and resilient, and require considerably less infrastructure and maintenance for customers. The success of the FIDS service is clear because by the end of March 2018 revenue was 10 times what it was in March 2015. From the outset, we started taking a greater look at the services the customers at Gatwick needed, and with an approachable due diligent team who thrived on customer satisfaction we quickly increased our portfolio of customers and the services we could offer them. Our internet, network and Wi-Fi services have been a big hit and allowed customer to remove their operational silos. The Gatwick Data Service which provides customers with Flight Information also had a high uptake, with the data being used to improve operational performance and provide airline’s, and transport agencies with data for their passengers. In 2016 we upgraded the Gatwick Trunk Radio system to digital, which allowed us to onward sell digital radio products to customers. We now have over 600 devices on the system and more than half of the customer base on the Gatwick Campus. So whether a customer is looking for flight information, internet, wayfinding services, data centre hosting, flight information display screens or airport data dashboards we offer a convenient and competitive service. We are continually investing in services to improve the reliability of services, including the quality of our network infrastructure with a £15m network upgrade recently completed, and announced in May 2018. The result is a resilient, self-healing and fault-tolerant network capable of handling future technologies that processes considerably more data. This is a key step future proofing our network services for customers. Airports are like a mini cities and Gatwick for example has more than 250 independent organisations based at the airport. It makes sense for us to provide a range of IT services to other entities on campus on a commercial basis. We are able to offer reliable services with 24*7 onsite support at a reasonable price. We made it very easy for the customers to take our services as per their requirements without locking them for long periods. Common IT services used by airlines, ground handlers and airport staff have helped us to integrate the operations more and improve efficiency. Additionally, we invest part of the revenue we generate on innovation. All of these have helped us to increase our customer base and revenue many fold over the last 4 years. In February 2018 we celebrated our 100th customer, with a current total of 105 customers. Since 2013, revenue grew with an average annual increase of 50%, and our revenue has increased to a current total of over £4.5 million. 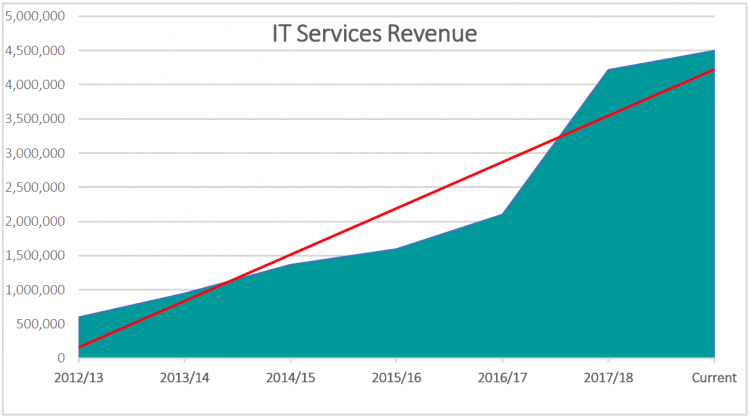 In summary, Gatwick IT Commercial Services is a supplier and innovative revenue creator of which assists Gatwick Airport to boost its turnover with a large portfolio of IT services and solutions. With more new services planned for the future, Gatwick IT Commercial Services is perfect for this award because the airport’s IT turnover has increased 7 times from what it was in 2013 – demonstrating true success through a strategic commercial model, customer focused engagement and tech led innovation.